Ceri Auckland Davies was born in 1951 and trained at Newport and Birmingham colleges of Art. He is one of Wales`s leading lights in egg tempera painting and a member of The Society of Egg Tempera Painters. Ceri has mastered the difficult age-old medium of egg tempera, making his own paints from egg yolk and pigment. There is a luminescence to his paintings that isn`t achievable with oils and watercolours. He captures the mood of his landscapes and seascapes in small bold sketches on the spot, later to be worked into large charcoals and paintings in his studio. The paint is applied slowly, layer upon layer. This rhythm of the painting process aids contemplation and suggests the subject is above the commonplace. Although it may only be a hint, we are always aware that these landscapes have more to say, if only we give them time to speak. To a certain extent the actual locations represented in the paintings are incidental to the atmosphere they portray. They are, without doubt, a vehicle to express the artist`s inner landscape. 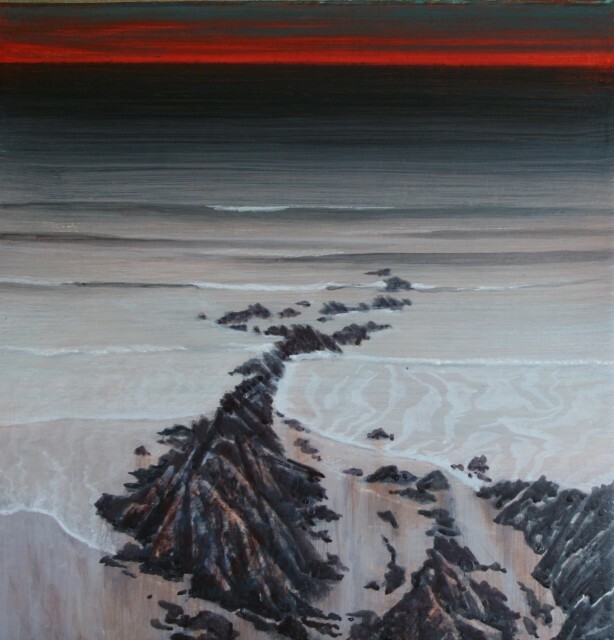 He uses land and sea as a metaphor for what he`s feeling and that tension is reflected in his paintings. His seas are sometimes serene, sometimes threatening. The dark caves and caverns hide a world of shadows and hidden depths. Ceri exhibits regularly throughout the U.K and internationally. The work of Ceri Auckland Davies is to be found in numerous public and private collections, including that of The Welsh Assembly and The National Library of Wales. Ceri had his first major exhibition with us in October 2017.